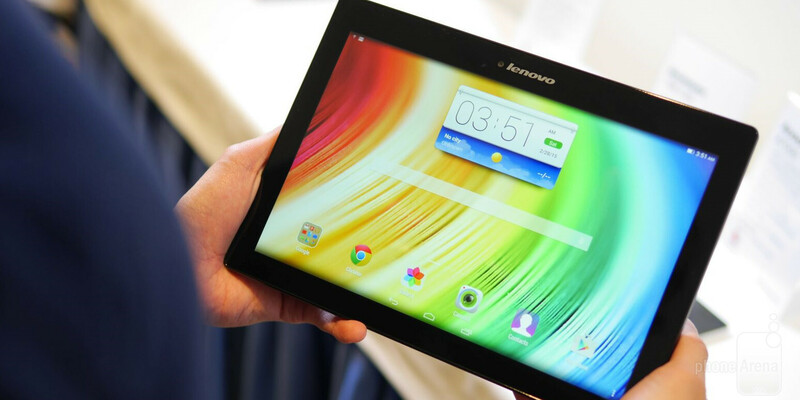 Enter the Lenovo TAB 2 A10, one of the two new tablets that the manufacturer just unveiled at MWC 2015. We were quite surprised by the hardware setup of the slate, which is actually pretty good for the affordable price that Lenovo will be asking for the device. We are dealing with a 10.1-inch display, which means that compact is not among its merits, but that's normal. The Tab 2 A10 is a tablet that is a bit on the heavy side, but this makes it feels quite solid and sit comfortably in your hands. Yes, you'll need both of these if you want to comfortably operate with it. If we take the specs sheet in one hand and gawk at it, we'd find a quad-core MediaTek chipset paired with 2GB of RAM, 16GB of native storage, a microSD card slot, and a sizeable 7,000mAh battery. As we also mentioned, there's a 10.1-inch 1080p IPS display on board, which is quite sharp but a bit over-saturated. Still, this gives it a pleasant vibrancy that we tend to like. Viewing angles are also surprisingly good. All in all, the Lenovo TAB 2 A10 should definitely be on your list if you're looking for an affordable, yet decent Android tablet. Very nice, has everything I want in a10.1" or bigger tablet, but why do we still get 16gb its 2015 32gb minimum please, even if a tablet has a sd card slot.